I noticed today that my security prices haven't updated since October. I am using the updater extension. I updated the extension and Moneydance but that didn't help. Now, the currency/security update runs VERY slowly (much more slowly than before -- and still doesn't actually update securities). I looked in the console and noticed that there are some Java exceptions thrown and an old transaction that seems to be syncing repeatedly. I have uploaded the console log. Can you please help restore security price updates? Looks like two problems. One syncing the other obtaining exchange rates and security price. For the first problem I would be tempted to reset syncing. What devices are you syncing to your windows 7 computer, another computer, phone etc. What syncing method have you set, Dropbox Folder, Dropbox Connect? There are some things in your error log that concern me. The line starting multires is what I am looking at. What extensions are you trying to load? There are various messages about netsync. Could it be that your are trying to use the Network Synchronizer? I primarily use MoneyDance on Windows 7. I am using Dropbox folder synchronization. I have an Android device with the MoneyDance App. I used to use MoneyDance on MacOS as well, but I had issues with recurring transactions so I stopped doing that. I don't think I am using network synchronizer. Attached is a screenshot of my extensions menu. On your computer set Don’t Sync as the syncing method. On the phone app Disconnect. Delete the “.moneydancesync” folder in Dropbox. Restart syncing from the start. Computer, phone. Give time between each step for Dropbox to sync. 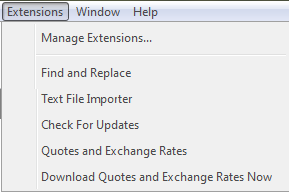 As for Quotes and Exchange Rates Updater is it up to date v1024 under EXTENSION – MANAGE EXTENSION. Make sure you have selected a source for both exchange rates and securities. Alpha Advantage is very, very slow. At some point it was slowed even further, not sure if that was before or after October. There is also a bug that can mislead as to if prices are actually being obtained. The Quote Loader is a lot faster and bug free. Download the PDF attached to post 114 and take a look. On page 1 there is a link to a YouTube tutorial that will give you an overview of Quote Loader. Try it out, let us know how you get on, any problems just post. Resetting the syncing resolved the java exception and the alternative Quote Loader appears to be working just fine. Kevin closed this discussion on 17 Apr, 2019 05:52 PM.